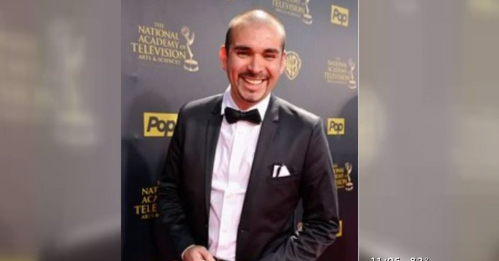 STUDIO CITY, Calif. -- A search is continuing for an Emmy award-winning producer and actor accused of stabbing another actor this week, reports CBS Los Angeles. According to the station, Clayton Haymes claims his landlord and manager Andre Bauth attacked him Tuesday morning at their Studio City home. "I was terrified for my life. I'm just happy to be alive," said the 23-year-old Haymes, who says that he's recovering from a stab wound to his chest, reports the station. He says his group of roommates had returned home from dinner and drinks when Bauth told them he would win five Oscars one day. "When he said 'five Oscars,' we all just kinda laughed a little bit, and he got really upset," Haymes said, according to the station. Haymes claims Bauth chased him into a room and swung at him with a knife a couple of times before allegedly stabbing him in a lung, reports CBS Los Angeles. He then reportedly left the house, and has not been seen since. As of Thursday night, the LAPD was still looking for him. "I just don't understand why he would want to do this to me 'cause we're friends," Haymes said. The two appeared in a film called "El Landlord," which Bauth produced. The detective investigating the case says the Los Angeles County District Attorney's Office has filed an attempted murder charge against Bauth and a warrant has been issued for his arrest, according to the station. Anyone with information as to Bauth's whereabouts is asked to call the LAPD's North Hollywood division.